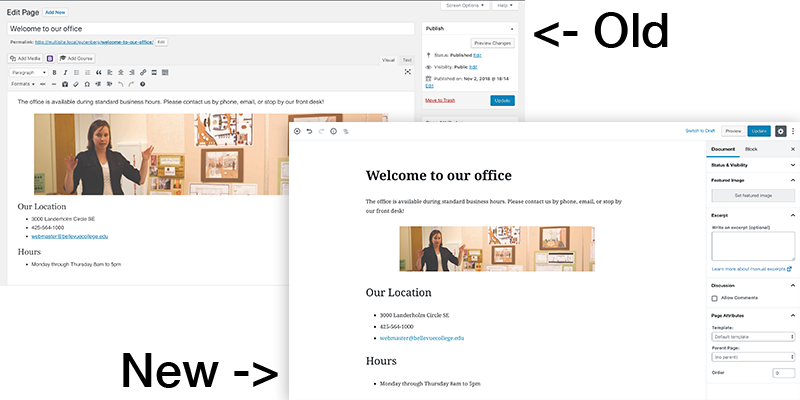 The WordPress core software, which we use to power our website, is introducing a new page editor that will eventually replace the existing ‘Visual’ page editor. This new editor, named Gutenberg, is designed to allow for more flexibility in content creation, as well as giving us on the development team new ways to create features that are more user-friendly and dynamic. When will the new editor become available? The Gutenberg editor will become new the default WordPress editor in the next version of WordPress, which will probably be rolled out to campus between mid-December and mid-January, depending on their release timeline. The existing editor will continue to be available for the next year at minimum, however- you will have a choice to ‘edit in Classic editor’. Want to try the new editor right away? If you love to be an early adopter, and want to explore the new options while helping us find any potential issues, please submit a ticket asking for the new editor to be enabled early. There is also a great video demo. No sessions available at this time. Sorry!